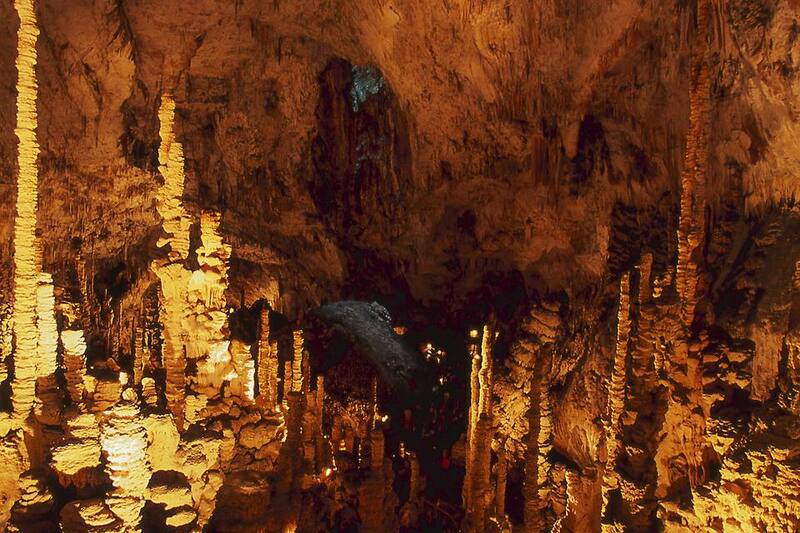 The spectacular cavern of the Aven d’Orgnac in the Ardèche in southeast France is classified amongst an elite group of Grands Sites de France for its vast underground halls. It’s located near the Caverne du Pont d’Arc, the replica of La Grotte Chauvet cave full of extraordinary art produced 36,000 years ago by the Aurignacian people. The third most visited cave in France was discovered on August 19, 1935, by Robert de Joly and four other speleologists. An opening in the ground gave no clue as to the world beneath the earth's surface, a world known to the people of the Paleolithic era. When you go down into the cave, you're going back millions of years. The first part of the cave was opened to the public in 1939. It took two further expeditions and another 27 years before the full glories were discovered. You start with a film that gives you an idea of what to expect; it's a rapid run-through of the cave which stretches for 2.8 miles (4 km). There's also a map which shows the whole cave, though you only get to see the first part. You see three chambers of the cave, led by a guide, though experienced speleologists and those with enough courage can go further if they book in advance (see page 3 for details). Visiting the Aven d'Orgnac is a very different experience from the Caverne du Pont d’Arc. It’s a descent into an extraordinary world of rock formations that have been growing for 100 million years. This is Nature’s art gallery rather than Man’s. 700 steps and you're in the first chamber, 55 meters underground. A glimmer of light from the original entrance falls on a huge mound. It’s made up of garbage from the locals, animal bones from cattle that died of disease and needed disposing of, and skeletons of wild animals which stumbled into the hole during the Ice Age, including a 400-year old boar and a bison from 15,000 years ago. It’s an impressive place, with enormous, strange rocks filling the cave; concretions of calcite crystals. Through the millennia, the slowly dripping water formed the stalagmites that rise from the ground and the stalactites that hang from the roof. My first impression was of Star Wars; surely George Lucas must have been in a cave exactly like this? You see three chambers as you go deeper into the earth past Nature’s weird shapes. Humans have given the major ones names: the Leaning Tower of Pisa which started forming 400,000 years ago; the pine cone; organ pipes; stacks of plates. In some places, the drips fall heavily from the ceiling onto a surface and splash out in a hypnotic rhythm. There’s also a surreal moment when the guide points to an urn sitting on a ledge beyond your reach. It contains the ashes of Robert Joly…Of all the caves that he discovered and explored, this was the one he wanted to be buried in. There’s a moment when a steep set of stairs almost halted me in my tracks as we looked down. The shapes change from organ pipes to what looks like draperies, material shaped into curtains and hangings. They’re in glorious shades of red, coming from the oxides and residues of organic matter held in the drops of water. The last stop is the deepest point you reach, 120 meters underground. It’s not the end of the cave by any means; below you are streams and cavities. The visit ends with a son-et-lumière show; music filling the silence and lights bouncing off the shapes. Luckily you don’t have to climb back up; there’s a lift. But even that has its surprises; look up to see -120 on the indicator. More information from the Ardeche Tourist Site. The City of Prehistory was relaunched in 2014 as a discovery center with the aim of explaining 350,000 years of European history. It's a good exhibition with displays of stuffed animals, tools and utensils and other artifacts used by Neanderthal man. Family friendly, there are enough touch screens and interactive displays to keep you interested, bringing out the archaeologist in you. It shows everyday life in the Stone Age when flint tools were first made. It’s all well done, but the explanations are at the moment only in French. There are plans to translate everything into English for 2016. Outside there are demonstrations of daily life: flint cutting and fire making which I saw on my visit. It was given by an English-speaking guide who went through the various processes to make fire. The first and most primitive method is to strike stones against each other. The sparks that appear momentarily land on a pile of finely shaved mushrooms. If you're lucky (and skilled), you add straw, and blowing gently create fire. It looks simple but it's not easy to do. Even this activity gives you more insight into a world millennia away from ours; only certain kinds of stones make the spark, and these came from another part of Europe. Clearly, prehistoric man traveled and traded far and wide. There are other methods to make fire which is harder work but I won’t spoil it for you. Go and see for yourself. Tour of the cave takes 1 hour. Go with warm clothes; it’s a constant 11 degrees. For the museum allow 90 minutes. There’s an excellent shop selling local Ardeche produce. There are guided tours of the Cité de la Préhistoire which you can reserve in advance. Book a descent into the cave as the original discoverers did. It costs €25 per person. You must be 12 years or older and relatively fit. There are other options, including the Underground expedition which lasts 3 hours and takes you further than the normal visit, and the Odyssee which lasts 8 hours. See details of these trips on the dedicated website page.